While a significant number of parts claimed to be for the next-generation iPhone have appeared over the past few months, the component of perhaps the most interest has yet to be seen: the main processor package. Speculation has covered a number of different possibilities including a die-shrunk A5 similar to that introduced in the revised iPad 2 earlier this year, an A5X such as found in the third-generation iPad, or an all-new A6 system-on-a-chip. 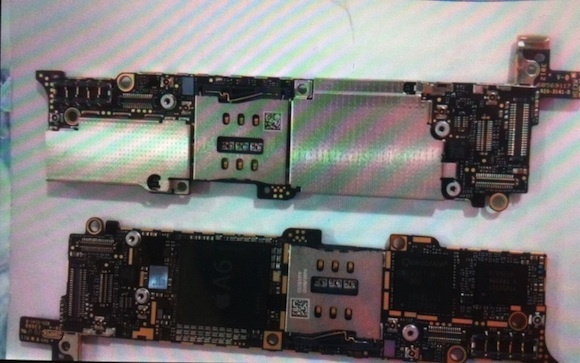 Several photos of the device's logic board have leaked in recent weeks but the low quality of the photos or the presence of shielding on the part have left the identities of the chips on the part unknown. Sonny Dickson, who has been digging up photos of a number of components leaking out of Apple's supply chain, has now posted a partial photo of what certainly appears to be the same logic board part seen in previous photos. 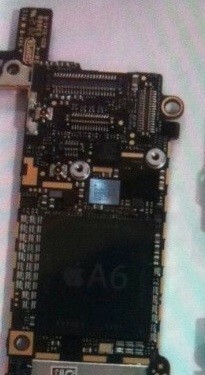 In this new photo, an "A6" designation can be seen on the main chip, suggesting that Apple may indeed be rolling out a brand-new chip family with the next-generation iPhone. It is difficult to assess the validity of the photo, as the photo could rather easily have been faked and the image's small size and low quality make it impossible to determine the details of smaller text on the chip, but it does offer the first specific photo claim of the chip to be included in the next iPhone. Update: 9to5Mac has posted the uncropped version of the photo showing the part with and without shielding. Concerns do remain, however, over the legitimacy of the image. New, faster chip, bigger display with higher resolution, new body with less bezel, even thinner than before, yet more solid with back glass switched for metal, 4G LTE, and a new OS to go with it. This could be the biggest iPhone update ever, and people here will still complain like crazy. As soon as the A6 is a 2.0 TDI processor. if iPhone gets a quad-core A6... that is what could pull me away from the Galaxy S III I have been testing out. Who cares! Where's my NFC?! If theres no blu ray drive I am out... switching to windows forever screw apple. Here's what it looks like when you remove the luminance.